Did you know I keep cookies in my pocket? Oh, did you want one? Then come meet me on my book tour! 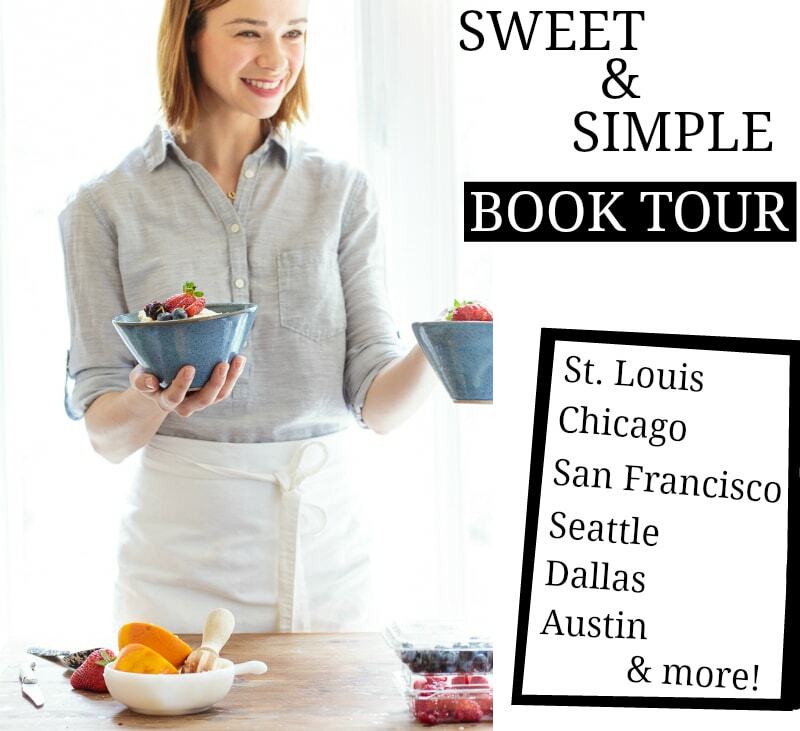 I’ll be signing copies of my latest book, Sweet & Simple: Dessert for Two in a handful of cities around the country, because I want to meet YOU! I’ll keep this page updated with details as they come in. (See the menu bar at the top? The highlighted purple tab is the best way to stay updated). April 23: Augusta Winery Dessert & Wine Pairing Party! Come, drink wine with me! I’ll be mildly inebriated, signing books, and dancing to live music. May 7: Madewell Store Mother’s Day Dessert & Shopping Party! We all know Madewell makes the best jeans in the world. So, bring your Mom in, buy matching jeans, and eat desserts with me! I’ll be signing books, but more importantly: there will be a fun coupon for all Sweet & Simple fans! May 15: Cook’s Warehouse open-house tasting and signing! There will be cheesecake. Do you need to know anything else? June 11: Read It & Eat Cooking Demo & Signing Party! I’ll bake for you, feed it to you, and sign books for you! You don’t want to miss this event. Have you ever been to a book store entirely devoted to cookbooks? Did you think that only existed in Heaven? Me too! But you and I can hang out together in this Heaven-on-Earth book store! Here’s the link for more info & to buy tickets. One other signing in the works for Chicago. Stay tuned! I can’t wait to see you in Seattle! You know I’m a Texas girl! I can’t wait to do signings all over my hometown! I’ll update as details become available. Quite possibly my favorite city in Texas. I’ll share details soon! I second Michelle’s request about Philadelphia! Moving to Dallas! How exciting! Can we be friends in real life? I live in Plano!!! I hope you get to make it to the NY / NJ area so I can hug your face! We have to meet, Dixya!!!! I would love to have you come to Meridian, Idaho. I know it is out of the way but it is a beautiful city. You should come to Sur La Table. Main Street Books in Minot, ND. I was gonna say Fargo, North Dakota but Ill settle for Minot if you can’t do both. Oh so glad you’re coming to Atlanta. Look at the WILLIAMS SONOMA at the Avalon shopping center it’s a lovely new shopping area in Alpharetta just outside atlanta. I think you would love it! Thanks for the tip, Patty! We’re looking at Cooks Warehouse for Atlanta..have you heard of it? Hurrah for Texas! There is a great donut place called Top Pot up there. oooooo, I will tell my cousin to look you up! She is in Plano. Yes. Please come to Tampa! Good luck on the tour! And with the move. I hate to move….sigh. Tell your hubby that Southern California isn’t much cooler than Dallas any more…. 8-\. I live south of San Diego, less than a mile from the beach, and it’s hotter here now than it was back in the ’60s in an inland valley! But, according to some, there’s no such thing as climate change. Thrilled to hear you’ll be moving to Dallas. And duh, come to LA! Too bad you’re not coming to Maui. Love your recipes. That would be a dream, Bev! Oh! You can’t possibly leave out the Happiest Place on Earth! Please come to Orlando, Florida! Since you’re already used to the Texas heat, You should be quite comfortable here????. Would love to meet you in person, even at the risk of exposing to my husband that I didn’t come up with all of those fabulous recipes myself. good luck with your move and book tour. NASHVILLE, TENNESSEE IS A-MUST ON THE FUTURE CITIES TOUR LIST!!! Everyone loves Nashville (says the Texas-native ????). I totally agree, Tua! I’m working on it because it’s within driving distance of me right now! Please stop by Sacramento while you’re in San Francisco! I’d love to meet you and your family!! My whole family has fallen in love with Your recipes. The only good thing about living in Houston would be a visit from you. Please shine a little bright light on this place. Awww, you’re not liking Houston? I’ve only been once, and that was 10 years ago (I’m so old LOL). Will try to come to SF to see you and bring my Bella along…and some jelly bellies for your sweet girl! Let us know once you know where you’ll be!???? Congratulations on your move. Any chance you could bring your book to her to Phoenix? Omg! I seriously cannot wait until you’re in SF! So excited! I really hope you make it to NY – Brooklyn/Manhau. Your going to San Francisco….and not Los Angeles! ???????????????? Ok….☹️Well I still want your book ???? I think you should come to Colorado!! I hope you can make it out to Portland, OR! It would be great to see you along your book tour. I have all of your book and love them. Hope your move goes smoothly! Pleasee add Houston to your list.. You have Dallas and Austin would not be fair without Us.. I would love to meet you and get signed books! Do you have a location yet for Atlanta? I think that’s my closest location of your tour. Thank you so much for all you do! I love your recipes and being able to still enjoy yummy foods in smaller quantities. Any chance Kansas City might make your list for your book tour? Would love to meet you and have a signed cookbook. All the best for your family, I’m glad you’re getting to move back home. Birthday blessings for your precious Camille. ???????????? So how about Nashville, TN?